There are two sides of the coin. When a new technologically cool gadget, software or anything of that sort is rolled out, one can expect the aspects that give it a thumbs down. With the new inventions come chances are that there are bugs too, that demand to be looked for and rectified. The latest buzz in the world of technology is QuadRooter an Android security bug that has reportedly put around 900 million devices at risk. Sounds scary, isn’t it? Wondering if your gadget is affected or not? If you are totally clueless and want to know if your smartphone is at risk and affected by QuadRooter Flaw then you got to read on and follow the simple steps listed below. 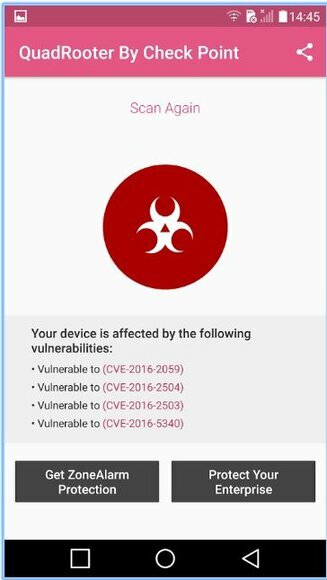 QuadRooter is a set of four vulnerabilities affects the Android devices running on Qualcomm chipset. By making use of these vulnerabilities, an attacker can exploit a device by gaining root access to the targeted phone. With these ‘high’ risk privilege escalation vulnerabilities one can trick the user into installing a malicious application, thereby gaining root access to the affected device. So, all the data, hardware like microphone and camera can be targeted. If you are using any one of the below listed smartphone, then sadly this is a matter of worry as QuadRooter has been affecting these devices. Chances are that Google will roll out these fixes with the September security patch. So none of the devices will see a patch for this until next month. The good news is that three out of four flaws have been fixed, yet one still persists. Now the point is how can you check if your smartphone is affected by QuadRooter Flaw? There is one simple step that you need to follow and continue with the given set of instructions. Download QuadRooter Scanner, which is an application from the Play Store and let it scan your device. 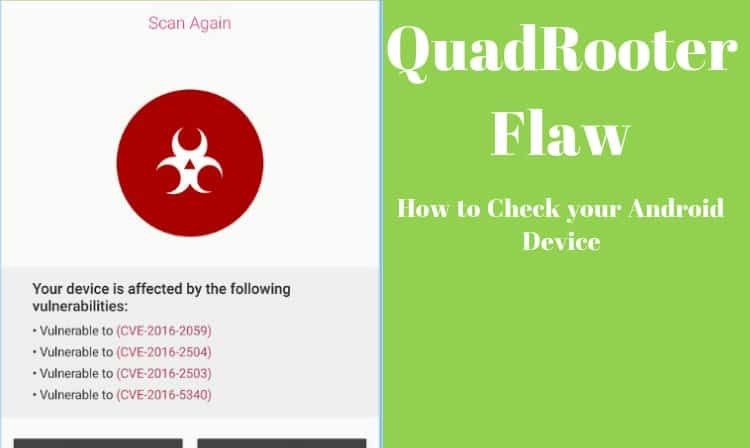 Downloading this app will enable you to get detailed information about the QuadRooter flaw. If your phone is affected, you will see an image shown below. Next month you’ll be able to see how a security patch from Google will be of help. Along with it, we have to wait for the smartphone manufacturer to roll these patch out. I have already downloaded the QuadRooter Scanner app to check if my device is affected by the flaw, but thankfully I am on the safe side. Download the app now and see if your device is affected or not. So, this is the method through which you can check whether your Android device is affected by QuadRooter flaw or not. If yes, you have to wait for Android to roll out new security patches that will clean your device from QuadRooter flaw.